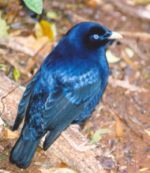 The male of the Satin Bowerbird is a beautiful but subtle sheeny purple, although it may just look dark from a distance. He has a purple eye, while the females, often seen in small groups, are a duller green. This bird’s bower (nest) is two parallel walls about 30-40 cm high, decorated with many blue objects and the occasional white object. The call includes a series of mechanical burbles. These birds are found in rainforests along the east coast of Australia. In the tropical rainforests of the north east, they are found only at higher altitudes.